Abu Dhabi Golf Club and Saadiyat Beach Golf Club, managed by the world’s leading golf management company, Troon, have been at the forefront of golfing news in the United Arab Emirates since the start of the year, due to their hosting of world-class tournaments on some of the best conditioned courses on the circuit. With these events having finished in spectacular fashion last month, Abu Dhabi has now opened its doors to the public, welcoming golfers to play their championship courses and walk the fairways played by some of the world’s best. These courses, alongside Yas Links, are the headliners when it comes to bringing golfers to Abu Dhabi and have been key in the capital’s evolution into one of the most innovative and progressive cities not only in the United Arab Emirates, but in the world. 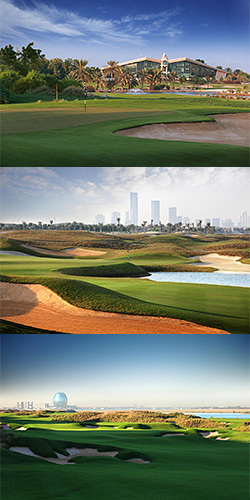 Abu Dhabi Golf Club and Saadiyat Beach Golf Club will be represented at next month’s Asia Golf Tourism Convention (AGTC), where golfers will be able to find out more information about Abu Dhabi as a golfing destination, while at the same time learning about the amazing culture and leisure that comes with a trip to Abu Dhabi. To discuss trade enquiries, please reach out to Clinton Norris, Abu Dhabi Golf Club and Saadiyat Beach Golf Club’s Senior Sales Manager who will be in attendance, beforehand. Besides the golf courses in Abu Dhabi, the capital is revered for the quality of its hotels, with fifty 5* hotels being found in the city, including over 2,000 rooms on Yas Island, the entertainment island. To make it even easier, the 5* The Westin Abu Dhabi Golf Resort & Spa sits on the periphery of Abu Dhabi Golf Club, giving guests a view of the idyllic course from their balconies. They can even walk to the 1st tee directly from breakfast. A trip to Abu Dhabi is not complete however, without experiencing all the world famous off-course attractions it has to offer, including the newly-opened cultural beacon and art filled Louvre Abu Dhabi, the stunning Saadiyat Beach, the fastest rollercoaster in the world at Ferrari World and the Sheikh Zayed Grand Mosque. Furthermore, visitors can experience real Emirati culture and History with the newly restored Qasr Al Hosn, Pearl Diving and can enjoy an afternoon of hospitality with an Emirati family. With Etihad having renewed their relationship with Abu Dhabi Golf Club and Saadiyat Beach Golf Club, luxurious flights, taking around 7 hours from most European and Asian cities, are available to those looking to visit Abu Dhabi in comfort. Added to this, Dubai is only an hour away from Abu Dhabi, giving golfers the opportunity to experience even more brilliant golf courses. Destination Management Companies are currently offering packages to Abu Dhabi, including flights and up to 4 nights and 3 rounds of golf for less than $1,000. There is no better time to book a trip to Abu Dhabi for a golfing holiday. The key golf tourism period in Abu Dhabi is October through to May, supplying golfers with a sun-blessed paradise in which to enjoy their golf. Abu Dhabi Golf Tourism Week will showcase this paradise and the very best of Abu Dhabi as a world class golfing and tourist destination at the end of April, where 40 golf trade and media personnel will be given an incredible experience in the capital. For all trade enquiries, including interest in the Abu Dhabi Golf Tourism Week, please email Clinton Norris - cnorris@adgolfclub.ae. To download the Abu Dhabi Golf Club and Saadiyat Beach Golf Club Destination Toolkit, please click here.